PT Bank Negara Indonesia (Persero) Tbk – BNI (IDX:BBNI) or referred to as “Bank BNI” is a well-established state-owned commercial bank in Indonesia which was founded in 1945. 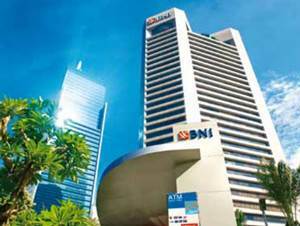 Bank BNI is widely known nationwide as the first state-owned bank that was established after the independence of Indonesia. Based in Jakarta, Bank BNI serves all segments of banking customers in the personal banking, priority banking, business banking, international banking and treasury. Bank BNI is majority owned by the Government of Indonesia. At present, PT Bank Negara Indonesia (Persero) Tbk is 60% owned by the Government of Indonesia and 40% by public. As of December 2016, Bank BNI runs its business through 17 regional offices, 196 branch offices, 948 sub branch offices, 623 cash offices, 96 mobile services, 17,056 ATMs and 8 overseas offices; BNI Singapore, BNI Hong Kong, BNI Tokyo, BNI Osaka, BNI London, BNI New York, BNI Seoul and BNI Yangoon. In term of financial performance, PT Bank Negara Indonesia (Persero) Tbk reached significant performance in the business year of 2016 (ended in 31 December 2016). Bank BNI reported total assets of Rp 603,032 billion in the business year of 2016. This reflected an 18.56% increase from Rp 508,595 billion in the same period previous year (2015), according to PT Bank Negara Indonesia (Persero) Tbk Annual Report 2016 as cited by JobsCDC.com. Referring to its annual report, Bank BNI managed to record total operating income in 2016 of Rp 41,229 billion, an increase of 16.93% from the previous year of Rp 35,258 billion. As of December 2016, Bank BNI controls total customer deposit of Rp 435.5 trillion and maintains total loans worth of Rp 393.3 trillion. Maximum age of 26 years old for S1 and 28 years old for S2 prior to the date of 5 July 2017. Minimum GPA of 2.75 for S1 and 3.25 for S2 within 4.00 scales (PTN/PTS). Willing to be placed in all branch offices of BNI in Kalimantan area. Fluent in local language is preferred. Copy of working reference (if any).